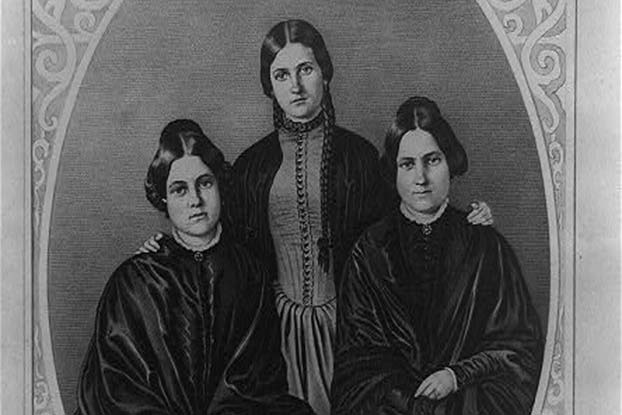 The Fox sisters were three sisters from New York, Leah, Margaret (also called Maggie) and Kate (also called Catherine). On the night of March 31, 1848 — April Fool’s Eve — 14-year-old Maggie Fox and her 11-year-old sister Kate reported a recurring mysterious phenomenon in their bedroom. Every night, as the two went to sleep in their clapboard farmhouse, they would hear a strange knocking sound coming from the walls. Even stranger, the knocking seemed to respond to their questions. “If you are an injured spirit, manifest it by three raps,” demanded the girls’ mother. Knock, knock, knock came the reply, The veil dividing the spirit world and the living had been breached! News of the Fox sisters’ wall-rapping spirit spread like wildfire through the spiritually flammable counties of upstate New York, also the birthplace of Mormonism and Millerism (later Seventh Day Adventism). Spiritualism promised a new kind of religious experience, in which believers could receive specific guidance about their lives from those with secret knowledge from the great beyond. Eventually, the Fox sisters brought their hugely popular séances to New York City, drawing huge crowds. Their routine evolved from simple knocking and rapping to conversations with deceased relatives and secret messages magically appearing on blank cards. The Fox girls became even more famous and their public séances in New York in 1850 attracted notable people including William Cullen Bryant, George Bancroft, James Fenimore Cooper, Nathaniel Parker Willis, Horace Greeley, Sojourner Truth and William Lloyd Garrison. They also attracted imitators; during the following few years, hundreds of people claimed the ability to communicate with spirits. Despite their fame — or more likely because of it — the sisters suffered from troubled relationships, psychological breakdowns and alcoholism. In her 50s, Maggie delivered a public confession of their long-drawn hoax, which started as a harmless childhood prank. At bedtime, they would tie an apple on a string and move it up and down, causing the apple to bump on the floor. The sisters later developed the ability to manipulate their knuckles and toes to produce a popping sound [source: Abbott].